Take a Closer Look at The Canoe Sail Kit. See how it attaches. See how well it is made in these close-up photos. Type H on a Radisson canoe above and on a Coleman below, illustrating the versatility of the Type H design. Stabilizer float arms (not shown) slide into the forward channel of the main front crossbar. Both configurations use the same mast, sail, spars, mast slide, steering oar, leeboard blades and have the same upgrade options. The configuration is quite versatile in how it can be set up. The smaller crossbar can be farther aft or farther forward along the bowsprit if that is convenient. The bowsprit can run over or under the smaller crossbar. In this photo, it goes under because the canoe has up-curving gunwales and so mounting the bowsprit on top of the main front crossbar and then under the smaller front crossbar levels it out. The mast can be anywhere along the bowsprit, though the best position for steering balance is usually about two feet forward of the main front crossbar. Leeboards allow canoe to sail across the wind and at an angle into the wind. They fight side slipping, just like a keel or centerboard. Both leeboards can remain in the water at the same time, requiring no attention as you sail along and make turns. If you sail into the beach, the leeboards just swing back as they come into contact with the sand. Looking down on the rig as the canoe sails along. Below: Rear crossbar and steering oar. Note that our oarpin clamps onto the oar holding the oar in place so the blade stays vertical and the shaft doesn't slide through the oarpin even if you let go of the tiller momentarily. A short strap secures the oarpin in place so it doesn't pop out when you're not looking and float away. At Left: Close up of mast slide. 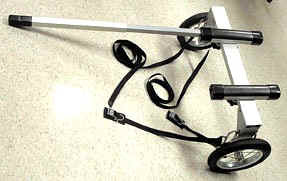 This is the part that bolts to the boom and connects the boom to the mast, with ability to swivel in all directions. Some might call this a "gooseneck." The sail, mounted on the spars, and raised to the top of the mast. The sail is raised by pulling down on the halyard and is held in the raised position by tieing the halyard end to the front crossbar or other fixed anchor point. The sheet rope controls sail position. The downhaul rope at the front lower corner helps level the boom and helps keep even tension on the sail so it takes the right shape. Canoe Sail Kit with Hydrodynamic floats and High Seat, above and 55 SF sail. Below, is a pic of 45 SF sail, mounted to a Pelican canoe. Many different sail color schemes are available at no extra cost. See the choices (click here) For example, Sail A is plain white, Sail D (below) is white with rainbow stripes, sail P is a pirate sail (black with skull and crossbones). Specify your choice of sail in comment section of your checkout screen. This picture illustrates what can be done designing the appearance of your own custom dacron sail (an extra-cost, extra-time option). Also shown are the optional polycarbonate leeboards (see item 5092). And the skipper in this photo is sitting on the "High Seat" -- an optional gunwale-height seat which facilitates shifting your weight to the upwind side. The item 999 canoe sail kit, ready to go (at left) or ready to stow (below). This is the item 6007 bag and the ENTIRE sail kit including floats fits inside! At left we see a canoe set up with 55 SF sail in the D color scheme. Upgrade to larger sail and taller, stronger heavy duty mast is item 5011. Also note second steering oar has been added. Sail kit always comes with steering oar socket on both sides but standard is just one oar. If you want to steer with the other hand, you have to shift the oar over. If you prefer, you can sail with two steering oars so that you can use either hand (letting the other oar go unused until you want it). Optional second oar and oarpin is here. Deluxe canoe sail kit package item 1008 (This includes item 1004 plus a special sailing seat, carry bag, cellphone drybag, and second steering oar).